As I mentioned in previous blog posts American TV series New Girl is not known for product placement. On the contrary: product placement has been practically non-existent. 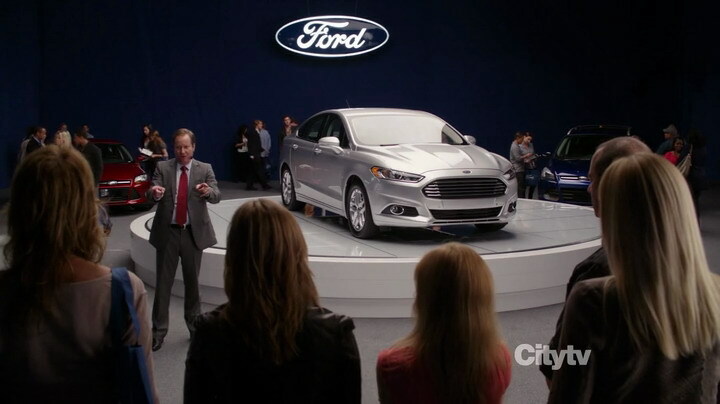 But in the fifth episode of the second season a huge brand appeared in the show: Ford with its 2013 Fusion model. one of the characters used the car (sort of). Ford’s product placement represented quite a large part of the episode and was also one of the most important parts. [SPOILERS] At Cece’s birthday party Jess wasn’t having much fun and unintentionally called Cece dumb. Cece heard this and then had a proper fight with Jess. Cece then stormed away and got drunk. The next morning Cece had a work to do – she should be a model at a car show, for the Ford Fusion. Cece and Jess went together, but Cece was unable to do her job, so Jess volunteered – she told the Ford guy that she was a model, too. The Ford guy knew she was lying but didn’t care. Product placement was now in full effect. It consisted of a guy describing Ford Fusion’s specs and Jess having all sorts of problems standing on her feet. The whole sequence lasted for around three minutes and at that time the Ford guy presented several characteristics of 2013 Ford Fusion. Hey, everybody, my name’s Gary, and I want to introduce you to the all-new 2013 Ford Fusion. Say hello to my good friend Jessica. The all-new Fusion has been totally redesigned inside and out. All-new styling, 18-inch aluminum wheels, three-year, bumper-to-bumper warranty, five-year power train, available Active Park, available lane-keeping system, standard voice-activated SYNC. From power plants that enhance efficiency the high-voltage lithium-ion battery pack provides enough power to operate in all-electric mode for short commutes– very smart. The Ford Fusion is designed to be environmentally conscious. Fusion Hybrid and the Fusion Energi are each powered by a combination high-voltage electric motor that utilizes… recycled material. The Fusion is available with an EcoBoost engine… a hybrid, and a plug-in hybrid. The SE Hybrid is available with eco-friendly cloth seating. No matter what color your seats– ha!– they’ll be green. Smoother rides, more fuel efficiency… The hybrid gets 47 miles to the gallon, so you’re gonna be filling up your tank less. There’s also the available auto start-stop. What can we say about the placement? It was included in a TV series that rarely uses product placement. NEUTRAL: PLUS (because it stood out) and MINUS (because the show was product placement free). The Fusion sequence was three minutes long, which might be good for Ford, but was a bit over the top. NEUTRAL: PLUS (long = good) and MINUS (to be honest: it was too long). All in all: a great placement for Ford. Love it! I usually watch the show and didn’t even notice the Ford Fusion got a placement until I saw your article. I realized I missed that episode and will have to go back and watch it.